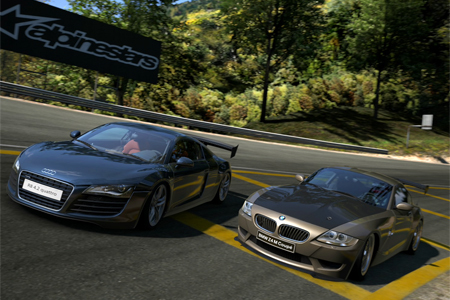 Me and my brother Dennis are racing for each others cars in Gran Turismo 5 for PlayStation 3. Since I came back to Indonesia to work for marketing and communication agency Publicis Indonesia I started to play online games again using the PlayStation network (PSN). Me and my brother Dennis (a.k.a. Corbatjov) started to make appointments to play games Gran Turismo 5 and FIFA 11. Whenever we play Gran Turismo online we agree on maximum the amount of horsepower and what track we are going to race on the next time. Then a high speed and risky battle commences because we agree that the winner of the 10 lap race received the other one's vehicle. Up until now we have raced three times, which I have managed to win only one time right now. During the first race we did, Dennis was driving a black Toyota 86 GT and I was driving a red Toyota FT-86 concept car from 2008. Due to an error I made in one of the first laps there was quite a time gap but I managed to make that gap shorter and shorter on each lap. Finally at the last corner, during the final lap, I managed to overtake Dennis' car but he managed to overtake me again just before the finish line using slip stream. I had to give him my car. When we did the second race I was driving a fully tuned matte grey Mazda RX7 with black carbon bonnet and Dennis was driving a partly tuned white Mercedes CLK AMG at the Monza circuit. This time I managed to win big time because I tuned the transmission to deliver higher performance at low RPM. Today we did another race between Ferrari's on the High Speed Ring circuit, he was driving a green F40 and I was driving a 'Havana' chocolate 599 GTB. We drove on a wet track where I messed up at multiple corners ending up doing 360's, I felt quite sad when handing over my newly accuired Ferrari 599. But lucky for me, we decided to do one more final showdown for today. The requirements were that the car has to be German made and cannot have more than 400 horsepower, the track would be the Trail Mountain Circuit. Dennis chose a blue Audio R8 4.2 Quattro and I picked a brown BMW Z4 M Coupé with (again) and lightweight black carbon bonnet. Both of them are tuned to produce exactly 400 BHP. We decided to do 20 laps on this track, this resulted in Dennis to do a pit stop twice and me even three times due to the racing soft tyres we chose. These tyres gave us most grip but they wear out very quick, making it harder and harder taking these sharp corners every lap. Having to stop at the pits one extra time compared to my brother, a time gap had evolved from a few seconds to more than half a minute! However, with still six laps to go he noticed I was getting closer on every lap just like our first race. The final lap was finally there, we pushed ourselves even more to get as fast as possible around those corners. In the picture above, during the final lap, I almost managed to overtake the Audi about half way the track but he cut me off in that corner. Later, before the finish line, the final sprint commenced; we were very close to each other and my BMW was riding exactly behind the Audi leaving no space to overtake. One final short sharp S bend corner before the end of the race and I pushed my car to the limit and took the corner a bit too sharp, leaving the car almost flying across the asphalt. However my driving line in that corner was more like a straight line: I had a bit more speed than the Audi on the last straight. Landing on the left side of the track, nearly bumped into the guard rail but.. I did it! 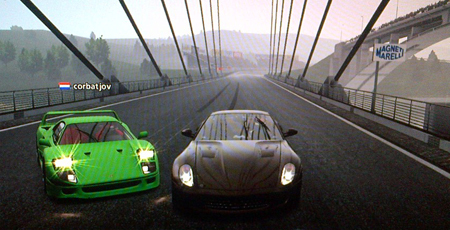 Overtook Dennis in his R8 just before the finish line with a time difference of less than 0.500 seconds! It was an amazing race, we both felt this was insanely intense! I gained his awesome Audi R8 and set our current score to 2 - 2. We both saved the replays afterwards. The pressure is still on as we keep on making appointments to race for each others cars in the future. I hope we can keep up racing like this for a long time. Good job, bro!